The form builder allows to build various forms: mailing list subscription, contact form, subscription forms, event registration, online order form, etc. The form is a block containing some input fields that have to be filled in by the users. It can be used to send some data by email or to an external processing. In the case of sending by email, users can receive a receipt if desired. A form with default input elements is created when dragging the form from the elements bar to the page. After that it is possible to add or remove elements, in the form like in any block. Input elements are fully customizable. The destination can be your email address to receive the form in your box, or it can be a URL of another webpage who will receive the data (typically something like http://third-party.tld/your-processing.php). 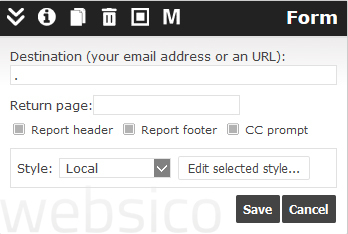 The return page is the page where to redirect the visitor after sending the form. report header and report footer are texts that frame the copy of the message the visitor will receive: an expression of thanks, your signature, etc. CC prompt is the text asking if the visitor wants to receive a copy of the message; there is no demand if the text is empty.